Warren J. Samuels has been a prominent figure in the study of economics in the twentieth century. 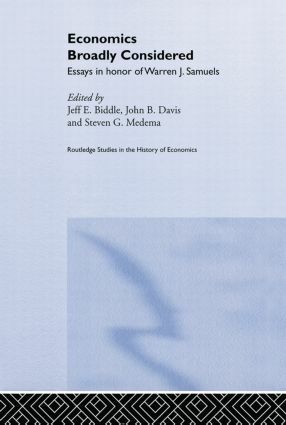 This book brings together essays by leading scholars in the areas of economics in which Samuels has made his most important contributions: the history of economic thought, economic methodology, and institutional and post-Keynesian economics. The institutional structures that shape economic activity and performance. The variety of approaches to economic analysis. The importance of the history of the discipline both inherently and for the study of economics in the modern age. With essays from leading scholars, collected and introduced by some of the most eminent authorities in the field, the work is a formidable volume, and one fit to honor one of the most renowned economists of our age. Jeff E. Biddle is Professor of Economics at Michigan State University. His research in labor economics and the history of economic thought has been published in such journals as the American Economic Review, the Journal of Political Economy, the Journal of Labor Economics, and History of Political Economy. John B. Davis, Professor of Economics, Marquette University, is editor of the Review of Social Economy and the Routledge series, "Advances in Social Economics." Steven G. Medema is Professor of Economics at the University of Colorado at Denver.